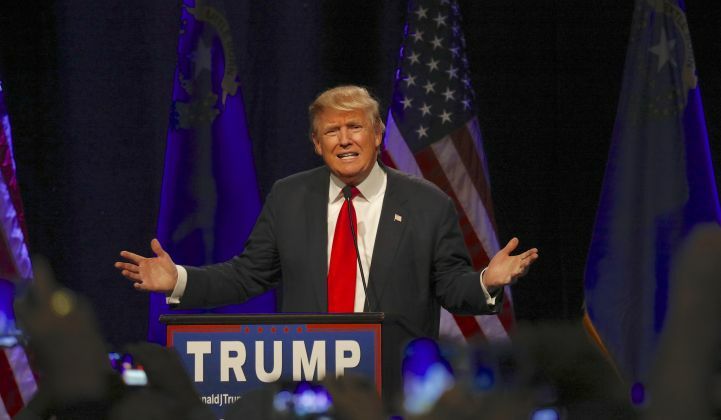 Donald Trump is by no means the first Republican presidential candidate to express support for the oil and gas industry, but his predecessors seemed to have a better grasp of how the industry works. The businessman and reality television star told a conference of fossil fuel professionals in Pittsburgh Thursday that they and their coal-mining brethren had fallen on hard times under President Barack Obama, but that Trump could fix the situation. All he has to do is remove restrictions, and prosperity will rain down upon the industries. "America is sitting on a treasure trove of untapped energy, some $50 trillion in shale energy, oil reserves and natural gas on federal lands, in addition to hundreds of years of coal energy reserves," Trump said. "It’s all upside for this country -- more jobs, more revenues, more wealth, higher wages and lower energy prices. I’m going to lift the restrictions on American energy and allow this wealth to pour into our communities, including right here in the state of Pennsylvania that we love." 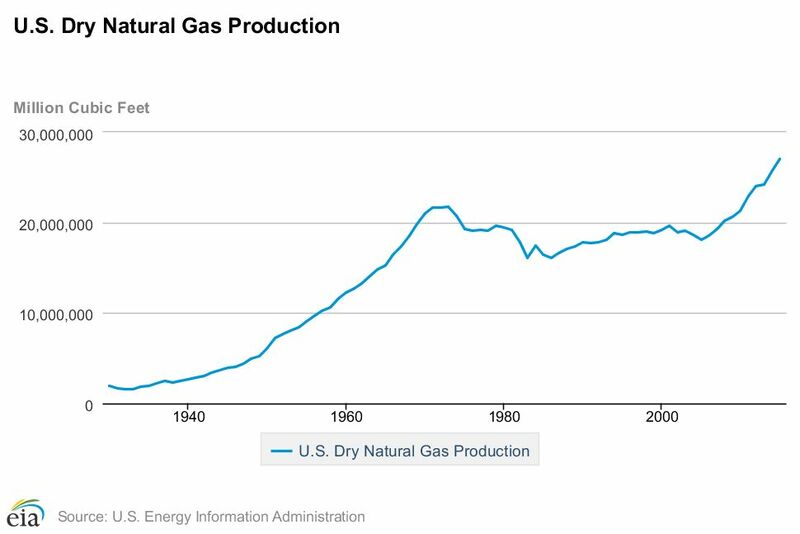 Presumably someone in the crowd at the Shale Insight Conference realized that U.S. natural gas production in 2015 beat any other year on record, but nobody elected to say so. U.S. oil production, after decades of decline, has been on the upswing since 2009. This wasn't a coal industry gathering, or someone might have mentioned that U.S. coal production peaked in 2008, which history books tell us came before Obama took office. If overbearing regulations from Obama didn't wreak these changes on the American energy industry, something else must have. The market forces unleashed by the success of hydraulic fracturing, perhaps. The sophisticated drilling technique came into its own in the first decade of the 21st century, enabling cheaper access to shale oil and gas deposits that had been uneconomical previously. That led to a flood of new domestic production, such that the U.S. now produces about 91 percent of the energy it consumes. The suddenly engorged supply of gas led to a drastic decrease in the cost of natural gas, due to a market dynamic known as "supply and demand," which did not merit a mention in Trump's speech. Coal production did not achieve a similar breakthrough in extraction technology, and could not match the price declines. When the cheaper fuel competes against the more expensive fuel to provide the same service, the cheaper fuel often wins. Thus, the stunning success of American oil and gas, of which Trump seemed unaware, abetted the demise of coal, which he lamented and blamed on the joint malfeasance of Obama and Hillary Clinton. Incidentally, low gas prices have also made it harder for nuclear power plants to compete in the market, but that energy source was absent from the speech as well. Similarly unmentioned was the last pillar of the American energy system: renewables. The ramp-up of wind and solar throughout the country has set consecutive records in recent years. Once operational, these sources incur no fuel costs, so they take precedence in the dispatching of generation for the grid. In markets with especially high renewables penetration, a surge in sun and wind can even drive prices into negative territory, meaning there's so much extra energy that customers will be paid to use it. Meanwhile, grid modernization efforts have reduced the need for new generating capacity in the traditional sense. Energy efficiency directly cuts demand. Demand response programs give utilities the ability to momentarily reduce load at times of peak stress. Energy storage gives users control over their energy consumption by charging up when power is cheap and plentiful and discharging when the grid is expensive and overburdened. There are still plenty of pressing concerns to address in the energy sector. How will the grid absorb high amounts of intermittent renewable energy, accounting for the vagaries of sun and wind? How quickly can grid infrastructure upgrade to support digitally networked technology, without opening itself up to cybersecurity breaches? Is there a way to preserve the low-carbon energy from nuclear plants that have become uneconomical for the time being? How can the communities that relied on coal income for decades find a new source of sustenance as that industry declines? Those are pressing issues that a lot of smart people are working to solve. Trump is trying to solve a natural-gas industry crisis that doesn't exist, and a coal industry crisis that does. Attacking that problem with "the elimination of all unnecessary regulations and a temporary moratorium on new regulations not compelled by Congress or public safety," as he proposes, won't alter the forces putting coal workers out of their jobs. It's hard to see the upside in that deal.